SGX's 10 largest OSV stocks, with a combined market cap of more than S$1 billion, have averaged a 30.9% price rebound from their 52W lows, in line with recent crude gains. The five that posted the strongest price rebound from their 12M troughs were: Amos Group (160.9%), Sinwa (57.9%), Vallianz (30.0%), Dyna-Mac (23.0%), and Baker Technology (9.2%). 5 of the 10 largest OSV stocks also saw increased average daily trading values over the past 1M, compared with the preceding 3M. The largest relative increases in trading turnover were generated by Dyna-Mac (83.8%), Baker Technology (57.1%), AusGroup (44.7%), Sinwa (31.9%), and Nordic Group (18.8%). Since the start of 2019, WTI crude has gained more than 30%, supported by production cuts from OPEC and its partners, in addition to supply disruptions in Iran and Venezuela following US sanctions. Last week, oil prices hit a 4M high of US$60/bbl. Singapore Exchange lists 35 Offshore Supply Vessel (OSV) players. These companies provide support services to offshore drilling rigs, pipe laying and oil-producing assets – including production platforms as well as floating production, storage and offloading (FPSO) units – used in the exploration and production (E&P) of oil and gas (O&G). OSV stocks are heavily dependent on the fortunes of the crude market. They are widely viewed as one of the key beneficiaries of a rebound in oil prices. A robust demand for oil leads to an increase in planned E&P activities, resulting in higher demand for rigs, platforms and FPSOs, which in turn boosts the OSV market. 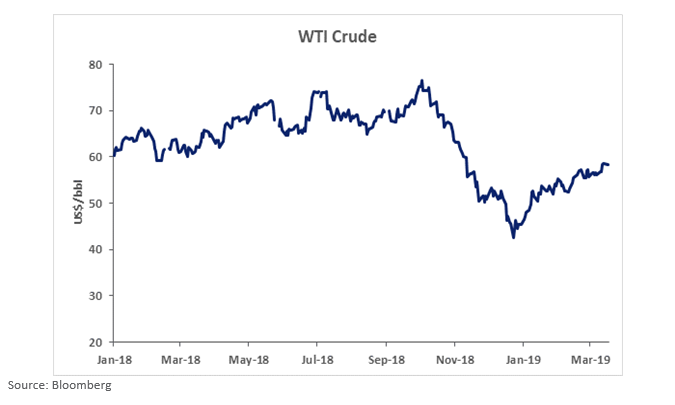 Since the start of 2019, WTI crude has gained over 30%, supported by production cuts from the Organization of Petroleum Exporting Countries (OPEC) and its partners – known as OPEC+, in addition to supply disruptions in Iran and Venezuela following US sanctions. After hitting a four-month high of US$60 a barrel last week, oil prices have since retreated, as risk-off sentiment increased on continued uncertainty over the US-China trade war and disappointing economic data from US and Europe. Saudi Arabia signalled earlier this month that producers may need to extend their 1.2 million barrels per day of supply curbs past June into the second half of the year, as OPEC’s job of rebalancing the oil market was far from done. The 10 largest OSV stocks on SGX have a combined market capitalisation of more than S$1 billion. These 10 largest players have also averaged a 30.9% price rebound from their 52-week lows, in line with recent crude gains. Among the 10, five that posted the strongest price rebound from their 12-month troughs were: Amos Group (160.9%), Sinwa Ltd (57.9%), Vallianz Holdings (30.0%), Dyna-Mac Holdings (23.0%), and Baker Technology (9.2%). The table below details the current and 52-week low prices for the 10 largest OSV stocks, sorted by market capitalisation. In the 2019 year-to-date, the 10 largest OSV stocks have averaged a total return of +9.8%, bringing their one-year and three-year total returns to -26.0% and -22.4% respectively. 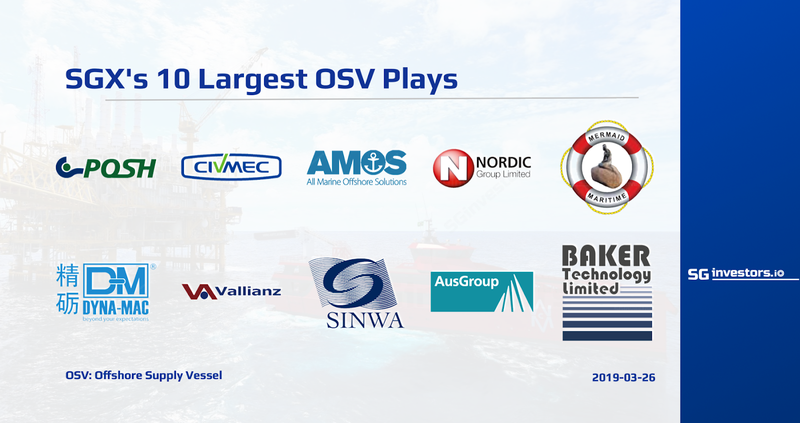 The 3 best-performing OSV players in the YTD were: Amos Group (+160.9%), Sinwa (+15.4%), and PACC Offshore Services (+0.6%). The table below details the year-to-date, one-year and three-year total returns for the 10 largest OSV stocks, sorted by YTD returns.